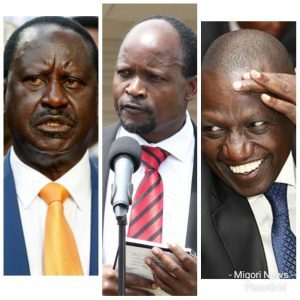 It is now official, Deputy President William Ruto and Migori governor Okoth Obado will work closely ahead of 2022, a move which will undermine Raila Odinga and ODM in Nyanza region. The two declared to work today when they spoke at Kendege in Kuria East in Migori County on Saturday where they were on another tour after the one on Monday. “Is there a problem if I worked with governor Okoth Obado? I will continue to walk with him in delivering development to our people. I will not mind what will be said of our closeness,” he said. Obado hinted at a political union with the DP calling Raila a crocodile who was out to eat him alive. “I would like you to condemn this so called crocodile, which some people wanted me to be swallowed with. Let us not allow this crocodile to eat us up,” he said. “I am ready to work with the DP now and in future,” said governor Obado. He was hosted by Obado, Kuria East MP Marwa Kitayama, Suna West MP Peter Masara and Kuria West MP Mathias Robi. Masara skipped Ruto’s Monday tour, and turned up for the meeting after he was scared off by his political rival, former MP Joseph Ndiege. Other included Kiharu MP Ndindi Nyoro, Nyaribari Chache MP Richard Tongi, former Migori Senator and now high commissioner to Abuja Wilfred Machage and other local politicians.